Much of the chimney system goes unseen by the naked eye, so it can be difficult to know just what kind of condition your chimney system is really in. This can also make troubleshooting and determining where safety issues and efficiency problems truly lie a challenge, leaving you frustrated and concerned every time you light up a fire in your fireplace or stove. What’s going on in there? One of the biggest threats to both safety and efficiency is a damaged chimney liner. The chimney liner is the clay tile or metal lining that runs the length of your chimney and ushers smoke, gases, sparks, and other byproducts of combustion up and out of the chimney and home. This important component doesn’t just protect the masonry of the chimney and nearby framing and combustibles from the harsh heats and corrosive byproducts of the fire – it also serves to keep carbon monoxide, smoke, and other inhalants from entering your home and lungs. An important job, indeed! But this doesn’t have to mean the end of fireside enjoyment! Here at Copper Top, we reline chimneys with highly durable stainless steel liners. 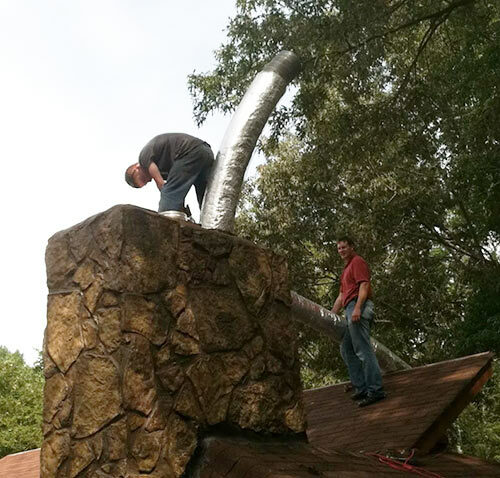 Whether your existing liner is terra cotta, aluminum, metal, or M.I.A., our technicians can restore your chimney’s safety and efficiency by relining with stainless steel. Stainless steel is a great choice and a worthwhile investment, not solely because it’s long-lasting, but because it is approved for use with all fuel types. This means that, whether you continue burning wood or switch over to gas, as long as the new appliance is appropriately sized, your stainless steel liner can vent your new appliance as well. We carry a wide assortment of quality liners in a variety of sizes, so whether your chimney needs a flexible liner or a rigid pipe, you can count on us to provide it. Our stainless steel liners are built to last and carry a lifetime warranty. Is it time you had your chimney professionally inspected and relined by licensed and insured technicians? Call Copper Top at 770-944-1200 or request an appointment online today! If you’re thinking about installing a new fireplace or heating appliance, call on our chimney and fireplace service experts to get the job done right!